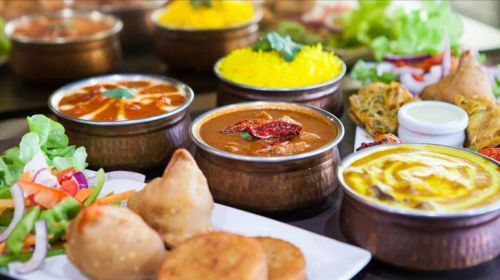 Menulog delivers for Indian Brothers - Annerley so you'll be able to track your courier on a map. Deep fried puff pastry filled with mashed potatoes and peas. Spiced lamb minced in deep fried puff pastry. Onion rings deep fried in chickpea batter and served with tamarind sauce. Indian style cheese flavoured with fresh herbs and spices then deep fried in chickpea batter. Barramundi fish marinated with garlic, herbs, spices and served with mint sauce. Marinated in yoghurt and spices. Served with mint sauce. An assortment of items (Samosa, Pakora, Chicken Tikka and Lamb Seekh Kebab). A delicious selection of 2 Onion Pakoras, 2 Vegetable Samosas, 2 Aloo Tikkis and Paneer Pakora served with tamarind chutney. Samosas topped with chickpeas, onion, coriander, mint, tamarind and yoghurt sauce. Potato cake layered with spices, topped with chickpeas, onion, coriander, mint, tamarind and yoghurt sauce. Homemade papris topped with potato, onion, mint, tamarind, yoghurt sauce and coriander. Homestyle chicken cooked with fresh onion, garlic, ginger, chilli and coriander. Punjabi style chicken on bone roasted in a clay oven and toasted in butter gravy with nuts and finished with aromatic spices. Minced lamb marinated in medium herbs, spices and cooked in a tandoor oven. Boneless chicken pieces marinated in garlic yoghurt, grilled in a tandoor oven and served with mint sauce. Prawns marinated with tandoori spices, cooked in a tandoor oven and served with mint sauce. Lamb Seekh Kebab, Chicken Tikkas, Chicken Wings and Lamb Cutlets served with mint sauce. Tender cutlets marinated in fresh herbs, spices, cooked in a tandoor oven and served with mint sauce. Chicken simmered in a rich creamy tomato sauce with cashew. Chicken pieces cooked in a tandoor and simmered in Indian style butter gravy. Succulent boneless chicken simmered with mango pulp and fresh spices. A rich curry, cooked in a cream and cashew sauce. Baked chicken blended in tomato, onion, gravy with chunks of onion and capsicum. Chicken cooked with almonds in a fresh tomato based curry and garnished with coriander. Chicken coked with fresh onion, tomato, ginger and fresh coriander. Chicken cooked with onion puree and coconut cream sauce. Boneless chicken cooked with spinach ands spices. Chicken fillets cooked with onion, garlic, ginger, curry leaves and vinegar. Chicken pieces cooked with fresh tomato, garlic, ginger and chilli topped with fresh coriander. Boneless chicken cooked in a blend of hot and spicy sauce. Tender lean lamb marinated in a blend of garlic, ginger and yoghurt. Enhanced with cardamom and fresh coriander. Spiced meatballs cooked in herbs, our special spices and cashew sauce. Lamb cooked in our famous cashew creamy sauce. Tender lamb cooked with spinach and spices. Lamb cooked with fresh tomato, onion, ginger and coriander. Tender lamb cubes cooked in South Indian style with coconut cream and spices. A spicy dish from the exotic beaches of Goa, made using a unique blend of hot, aromatic spices and vinegar; giving this dish its distinctive flavour. Goat on the bone cooked with fresh capsicum, onion, ginger and coriander. Goat on the bone cooked with fresh garlic, ginger and coriander in a traditional Indian gravy. Fresh vegetables cooked in Northern Indian style. Lentils cooked with fresh tomatoes, onions and coriander. Chickpeas and potatoes cooked with tomato, onion and fresh herbs. A combination of spinach and paneer cooked in a light sauce of special herbs and spices. Homemade paneer in a mild, cashew creamy sauce. Homemade paneer sauteed with onions, capsicum and coriander, cooked in special gravy. Cubes of homemade paneer and fresh garden peas. Garden green peas and potato cooked with spices and fresh herbs. Eggplant and potato seasoned with fresh herbs and spices. Potato and paneer kofta ball cooked in a cashew creamy sauce. Fresh barramundi fillets cooked with mustard seeds, curry leaves, coconut broth with spices, ginger and green chillies. Fresh barramundi fillets cooked in traditional Goan style with coconut and exotic spices. Green prawns stir fried in a garlic, creamy sauce. A spicy dish from the exotic beaches of Goa made using a unique blend of hot, aromatic spices and vinegar; giving this dish its distinctive flavour. Green prawns cooked in tomatoes, onions and garlic. Prawns cooked with onion, capsicum, tomato and fresh coriander. Green prawns stir fried with garlic, fresh herbs and sweet chilli gravy. Stir fried Indian gourmet cheese, capsicum and onion, cooked in a tangy spicy sauce. Chicken cooked with onion, capsicum, herbs and chilli sauce. Stir fried chicken pieces tossed with capsicum, onion and garlic in a spicy gravy. Deep fried vegetable balls tossed with capsicum, onion and garlic in a spciy gravy. Onion, capsicum, olive, mushroom, paneer and cheese topped with yoghurt mint sauce. Pineapple, ham, bacon and lots of cheese. Boneless tandoori chicken, tomato, onion and coriander topped with yoghurt mint sauce. Chicken, onion, pickled jalapenos, sundried tomatoes and lots of cheese. Prawns, onion, shallots, capsicum and cheese topped with tartare sauce. Basmati rice cooked with creamy coconut sauce. Basmati rice cooked with mustard seeds and curry leaves. Basmati rice cooked with diced vegetables and bay leaves. Basmati rice cooked with spicy meat, fresh tomatoes and onions. Diced cucumber and tomato in yoghurt sauce. Perfect match for hot curries. Homemade yoghurt topped with spices, coriander and boondi (chickpea). A homemade and delicious mix of mango pickle and mixed pickle. Crispy pappadums served with mango chutney and mint sauce. Fresh vegetables - lettuce, carrot, cucumber, tomato and onion. White flour bread baked fresh in a tandoor oven. Bread layered with garlic, baked fresh in a tandoor oven. Bread layered with garlic and cheese, baked fresh in a tandoor oven. Bread layered with butter, baked fresh in a tandoor oven. Bread layered with tasty cheese, baked fresh in a tandoor oven. Chef's special naan. Bread layered with cheese and spinach, baked fresh in a tandoor oven. Bread layered with fresh minced onions, cumin and shallots, baked fresh in a tandoor oven. Bread layered with fresh minced onions and tasty cheese, baked fresh in a tandoor oven. Bread layered with fresh herbs and tasty cheese, baked fresh in a tandoor oven. Bread layered with fresh minced lamb, baked fresh in a tandoor oven. Bread layered with fresh minced lamb and tasty cheese, baked fresh in a tandoor oven. Bread layered with garlic, chilli and cheese, baked fresh in a tandoor oven. Bread layered with chilli and tasty cheese, baked fresh in a tandoor oven. Bread layered with chicken, chilli and tasty cheese, baked fresh in a tandoor oven. Bread layered with fruit, mango pulp, coconut and nuts, baked fresh in a tandoor oven. Bread layered with olives, capsicum and sweet chilli sauce, baked fresh in a tandoor oven. Wholemeal flour bread baked fresh in a tandoor oven. Gluten free bread layered with garlic and herbs, baked fresh in a tandoor oven. Bread layered with potato, herbs and spices, baked fresh in a tandoor oven. Bread layered with mild spices, potato and paneer cubes, baked fresh in a tandoor oven. Homemade ice cream prepared with a creamy and nutty flavour. Homemade ice cream prepared with a creamy and nutty flavour with rosewater. Creamy vanilla ice cream served with a chocolate topping. Traditional creamy almond and rice pudding. Lightly deep fried doughnut balls, dipped in rosewater syrup. A traditional Indian mango drink with yoghurt base. A traditional strawberry drink with yoghurt base. Mango or banana flavour. An Indian speciality!